From Boneloaf and Double Fine, Gang Beasts is a multiplayer physics-based brawler currently in-development for PC and PS4. Though the final version of the game has yet to release, the title quickly became an internet sensation due to its extreme potential for laughs, courtesy of the wacky costumes, physics-based fighting and unorthodox stages; such battlegrounds include the likes of a water tower, billboard, a free-spinning blimp, and a seaside Ferris wheel mounted to one of the most poorly-constructed wooden docks in gaming history. 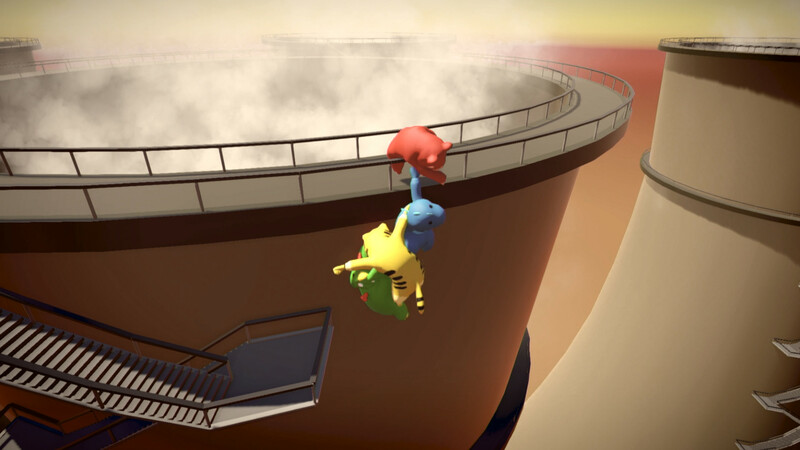 Gang Beasts has been available to PC gamers through Steam Early Access, but developer Boneloaf has quietly been at work on a PS4 version, as confirmed back in March 2016. Earlier today, Sony gamers anxiously waiting for their turn at Gang Beasts finally got a proper release date for the console version, now scheduled to release in mid-December. The console version supports a maximum of four players in a last-man-standing throw-down, along with the new 4-player horde mode and 2v2 soccer. PS4 gamers will also have access to all of the costumes and stages present in the Early Access PC version. While the original announcement from almost two years ago states that the PS4 version will support PlayStation VR, there is no mention of Sony’s VR platform in today’s announcements from Double Fine, Boneloaf or Sony. Gang Beasts will release for the PS4 on 12/12. Again, the PC version is currently available as a Steam Early Access title.